For starters, it's got F1 pedigree. Honestly, we weren’t expecting much from Infiniti’s latest concept, the Q60 Black S. We couldn’t have been more wrong. It’s much more than a dressed up Q60 Red Sport 400 with carbon fiber accessories. No, this thing has Formula One-derived technologies, right down to the execution of its trick carbon fiber aero kit and double rear wing. Infiniti CEO Roland Krueger explained to us at the 2017 Geneva Motor Show that the Q60 Black S concept must be viewed as "an alliance project," in reference to the Renault-Nissan alliance, which also includes Renault Sport F1. For example, this year Infiniti is beginning to deploy an energy recovery system, a project it jointly developed with the F1 division within the alliance. That word, 'alliance,' came up often during our talk, along with the walk-around tour of the Q60 Black S concept we did with Infiniti design chief, Alfonso Albaisa. Turns out it was no coincidence the concept was parked directly in front of a Renault Sport F1 car; you can clearly see the some exterior similarities. Yes, really. Examples include the way the front spoiler has been shaped, drawing direct inspiration from the F1 car’s front wing. Even the concept’s carbon fiber side sills are straight lines, just like in the race car. That double rear spoiler? You guessed it - F1-derived. Albaisa proudly told me the concept, the very one in front of us, powered by the twin-turbo 3.0-liter V6 that's further augmented by a hybrid system, is nearly production ready. If the greenlight is given, the expected changes would be dictated by what the engineers say is required, and Albaisa predicts those would likely boil down to small, yet vital details, such as the depth and shape of the deep (and functional) hood vents, as well as the curvature of the vent openings directly behind the front wheels. Of course there would be additional adjustments once the performance and wind tunnel data comes in, but you get the point. Black S, as both Krueger and Albaisa told us, is Infiniti’s answer to the likes of BMW M and Mercedes-AMG. Although we didn’t get a production version of the Nissan GTR-powered Q50 Eau Rouge, another example of Albaisa’s work, a production-ready Q60 Black S has the potential to more than make up for that loss. "Maybe in 12 months’ time we’ll be standing here talking about the new Q60 Black S just before it hits dealers," Albaisa said at the end of our talk. "It’d be the car I’d buy." And we happen to think a lot of other people are going to want one, too. But is it a grand tourer or sports coupe? Here’s an epic high horsepower long distance cruiser that won’t sink your bank account. 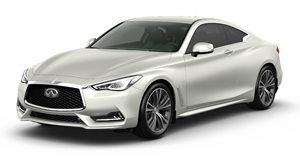 It’s not perfect, but the Infiniti Q60 is certainly amongst the most stylish executive coupes on the market.